(Tech Xplore)—Tell us another one. If you are at all like the rest of us, you wish the Siri-caller conversation could just stop, because you are working in the next cubicle or trying to read and re-read a paragraph in a library or about to crawl out the window in a packed commuter train. Apple evidently knows when you crave some sounds of silence, or at least softer talk coming from someone's device. Senior news editor at Gizmodo, Harrison Weber, reported on a patent filed by Apple in 2016 and made public this month, suggesting a voice assistant that could detect when you're whispering and know when to whisper back. 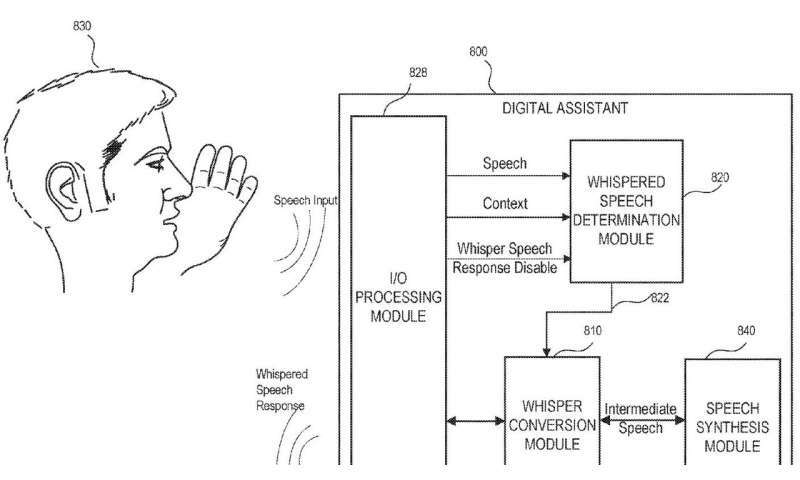 "Digital Assistant Providing Whispered Speech" is the title of the patent . The patent text said "a regular or loud voice" may be "undesired under certain circumstances where a whispered response is more appropriate. Providing a digital assistant that is capable of detecting whispered a speech input and providing a whispered speech response is thus important." Tom's Guide's Henry Casey said if the patent reaches real life stage, the digital personal assistant "just might know when to lower its voice." The concept would also involve detecting a whispered speech input and providing the whispered response. Casey said,"you could speak quietly to Siri—such as when you're going to bed, or not trying to attract so much attention." The patent text discussed a number of scenarios where this idea would make sense, as "while working at a cubicle with other co-workers surrounding the user. A user may also ask the device a question while attending a meeting in a conference room with other meeting participants. A user may also speak to the device while studying in a library where speaking loudly may be prohibited. Under some circumstances, the user may whisper speech to the device and/or desire that responses be whispered. It is thus important that a device recognizes the user's whispered speech, which may vary from normal speech, and provide a whispered speech response under these circumstances." How would this work? Casey explained: "The patent describes how a device—an iPhone or Apple Watch, for example—would analyze the amplitude and frequency patterns of the speech input, and compare it against other tones of voice, using something the document describes as a "whisper score." Meanwhile, Gizmodo talked to Alex Rudnicky, a professor at Carnegie Mellon University's Language Technologies Institute. "I can't really say why nobody's come up with this solution. But once you hear it, it sounds really reasonable. Why not?" A number of reader comments on other sites reflected the similar take that it was a good idea, even though it was pointed out on a number of sites that not all patents materialize into real-world products. Yoni Heisler in BGR: "Now I wouldn't venture to say that this type of feature will drastically increase Siri usage, but it certainly couldn't hurt. Over the past few years, Siri's ability to understand and process more complex and layered queries has improved by leaps and bounds. Perhaps the ability to ascertain the proper tone with which to relay back a response is simply the next logical step."